This article appears in print in the February 2019 issue, as part of the 100 Best Things To Eat cover story. Click here to subscribe. Anyone in the know heads to this stalwart bakery for the flaky croissants, but the sleeper hit is a tender ginger biscuit ($2.85) that you simply must order. Beans or grains and greens, the healthy brunch staple ($12) at this natural wine bar and café is perfection in a bowl, thanks to hot sauce and a seven-minute egg. If you can score one of these nutty, sweet mega croissants ($4.75) warm from the oven, it’ll change your life; beware the powdered sugar avalanche. A scatter of sea salt turns this caramelized cousin of the croissant ($3.50) into the star of this neighborhood spot’s pastry case. 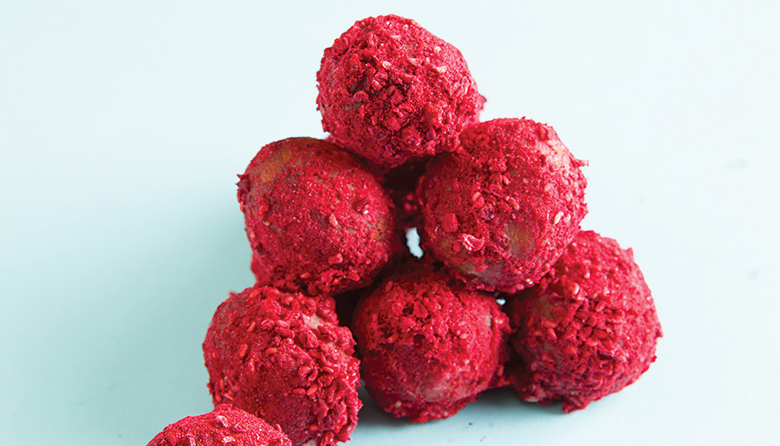 More tart than sweet, the vibrant red of these fresh-fried doughnut holes ($2.75)—dusted in freeze-dried raspberries—ups the appeal. The simplest breakfast sandwiches are the best ones. At this walk-up spot, it’s just bacon, egg and cheese on a house-made soft roll ($4). The excellent thick-sliced toast topped with muhammara and seasonal vegetables ($15) at this light-filled café makes a knife-and-fork meal any time of day. The indulgent epitome of French cuisine, this ham-and-Gruyère sandwich ($9.75), drenched in béchamel and runny egg yolk, somehow comes out (like everything here) eminently elegant. Although most of owner Rachael Coyle’s baked goods stick to tradition, it’s this creative combination of pretzel and croissant ($3.25) that best shows off her talents for creating flaky, buttery pastries. A few places in Seattle sell the yeasted, pork-stuffed sheng jian bao, what this mini chain calls “Q bao” ($9.50); and none nail the fried yet fluffy combination with such consistency. A great breakfast taco means more than just serving a good taco at the right time. This South End spot has nailed that mystery of mixing eggs and meat, and folding them into fresh-made flour tortillas ($2.50). Eltana makes Montreal-style, wood-fired bagels, but forget the lox: They go best with this North Africa–by-way-of-Israel stew of peppers, tomatoes and just-set eggs, topped with feta ($11.25). The entire breakfast menu here is full of gems (house-made yogurt! ), but head straight for the foul ($10): mashed favas crowned with vegetables, feta and eggs, and scoop it up with crusty bread. Welcome to central Mexico; in Seattle, it’s located in the back of a mini-mart. Weekend mornings are for this brunch tradition: pit-cooked lamb wrapped in warm tortillas and served with soup made from the meat drippings ($18/pound). The porcine faces of these buns ($4.25), from a State Route 99 strip-mall spot, are filled with sweet egg custard, not pork, and are a menu standout.